A deep cleansing bioactive exfoliant with natural skin restoring and nourishing properties. 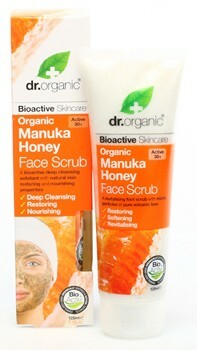 This Manuka Honey Face Scrub is a deep cleansing bioactive exfoliant with natural skin restoring and nourishing properties. A complex blend of bioactive, natural and organic ingredients combine to remove impurities and excess oil while restoring, nourishing and moisturising the skin. Natural micro-particles of volcanic lava, corn cob powder and ground fruit seeds are used to gently buff away surface grime. Dr Organic are a UK based producer of natural body care and hair care products including natural shampoo, natural deodorant and more. Best face exfoliant. I have heard a lot of good things about Manuka honey and you definitely notice the difference compared to other exfoliants. All the ingredients are soothing rather than harsh and leaves my face feeling very soft and clean. Love this scrub! Leaves the skin feeling clean without the dry feeling later. <EOL>Will buy again. <EOL>Thanks Shop Naturally for a great product.